I finished this a while back and I thought I would add the art here. It went in a little bit of a different direction than I it would. In the end, I was happy with the results. I hope it would make Crumb proud. Here is the original drawing. 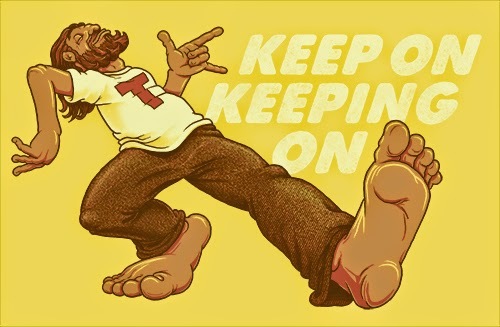 A while back a friend of mine mentioned that she would love a reproduction of a classic retro t-shirt design that she loved that was called "Keep On Truckin'." I like the concept and feel but I felt the art could use some updating, and some of my style, to make it even more awesome. I like the idea of the character looking more care-free and more hippie-like. I haven't heard the phrase "truckin'" in a long time so I thought "keep on Keeping on" might sound better contemporarily speaking. 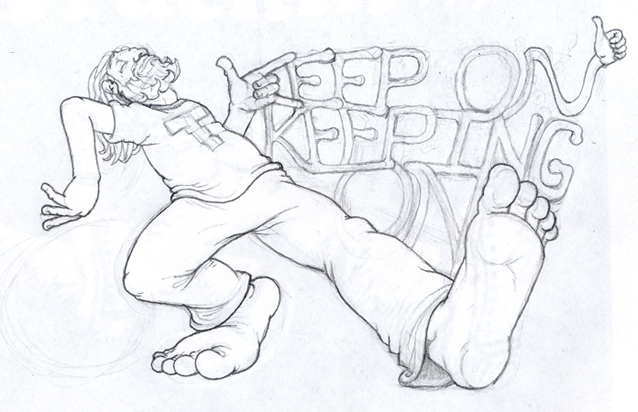 The original "Truckin'" design is below. I am not sure how many colors to make the design yet. I also might change the text style and even the actual phrase is something better comes up; I considered a the recent pop-culture phrase "Haters gonna hate." If you have any thoughts or ideas to add I would be much obliged.